The M28 Cordless Woodcutting Circular Saw is the industry's most powerful cordless saw ever produced. This revolutionary saw has the most power of any cordless saw on the market. Nothing can top the performance of this tool in terms of speed of cutting or overall run time. In addition, this saw comes standard with tactile grips for even more control while cutting. The lightweight magnesium guards reduce unnecessary weight without compromising operation. The high strength aircraft aluminum shoe resists bending for accuracy and dependability. Why waste time with extension cords and generators when the M28 Cordless Circular Saw is ready to go right now. No more downtime with cut cords or cords to trip on while working in precarious locations. The M28 provides the power of a corded tool with none of the added problems. 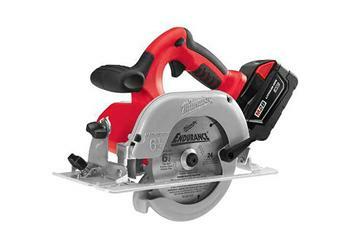 The M28 Circular Saw is only one of the many new M28 products now available from Milwaukee Electric Tool Corp. Depth of Cut at 90° 2-1/8 in. Depth of Cut at 45° 1-5/8 in. Depth of Cut at 50° 1-13/32 in.